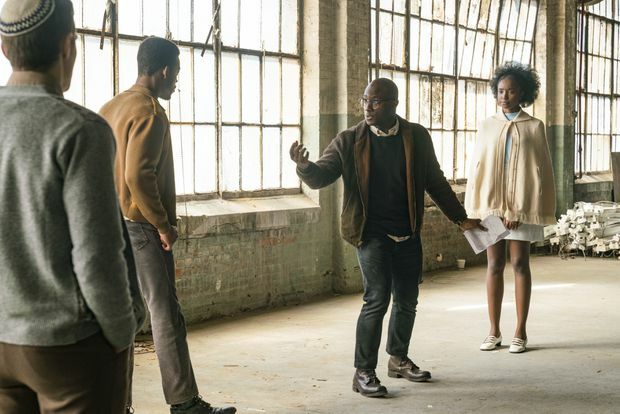 From left to right: actor Stephan James, director Barry Jenkins and actor KiKi Layne on the set of If Beale Street Could Talk. There’s an irrevocable weight to the writing of novelist and social critic James Baldwin. To adapt his work without the necessary intelligence, dedication and care of Baldwin himself is to degrade the material at hand. But then, so is any attempt to augment or affix to his work anything outside of itself. With Baldwin, things can neither be added nor taken away – indeed, his legacy is imbued with this direct and richly embodied way in which he wrote, communicated, loved and fought. The impact of his work lies in this unwavering precision: a rigour that is studied, but above all personal and poetic. When I talk about this work of adapting Baldwin to director Barry Jenkins the night after the world premiere of his newest film, If Beale Street Could Talk, at the Toronto International Film Festival this past fall, he nods appreciatively. The Oscar-winner is no stranger to this kind of undertaking. With his monumental 2016 film Moonlight, Jenkins and co-writer Tarell Alvin McCraney adapted McCraney’s piece, In Moonlight Black Boys Look Blue, with such great consideration for both the work’s material and lived sources. I’ve said it before and I’ll gladly say it again – there is perhaps no contemporary filmmaker better suited to adapting the work of Baldwin than Jenkins. As with Baldwin, Jenkins is a master of textured interiority – his characters come to life in as much as he allows them space to unfold and settle into lines of moment. Baldwin’s story of black love, of black womanhood, of systemic violence against black men, and of the black families who continue to hold themselves together within the wake of such violence, never mind the violence they face themselves, is no easy task for a two-hour film. Yet Baldwin’s lyrical prose – his ability to sustain presence as if it were story in and of itself – finds its perfect match in Jenkins’s film. The director holds blackness close, detailing its curvatures and tonalities with an empathetic eye; taking in all of its textures with the kind of care that can only be described as loving. Jenkins wanted to mirror Baldwin's 'very visual' language in his adaptation. Across his filmography, Jenkins balances the beauty of black life alongside the lived reality of being black in the United States. And any exploration of black lives necessarily entails a cogent expression of trauma, and an understanding of shaping that experience in a way that doesn’t wholly define us, but shapes us and informs our stories in differing ways. In this vein, newcomer KiKi Layne brings such sincerity to her role as Tish that it seems almost impossible to fault her for the in-situ development of experience she brings to it – especially given that this role is one for which she is so wonderfully suited. Likewise, Scarborough-bred actor Stephan James is nothing less than steady in his portrayal of Fonny, a young man deeply in love with Tish who comes to be falsely accused of sexual assault by a vindictive white police officer. But it is Tish’s parents Sharon and Joseph, played by Colman Domingo and the indomitable Regina King, who provide the sturdy backbone to Jenkins’s film. Looking at Moonlight and If Beale Street Could Talk in this light – as a loose cinematic diptych of black families, of black love – is illuminating. The critical scrutiny Jenkins faces coming off of Moonlight, easily one of the greatest contemporary and accessible works of art concerned with black life put to film, is not an enviable position. And with Beale Street, the director reminds us of black art’s necessary span – in paying tribute to our lives and subjectivities and that of those who came before us, there is no way in which we will ever be definitive. We are too vast to be reduced. And Jenkins’s work quite surely resides in that vastness.